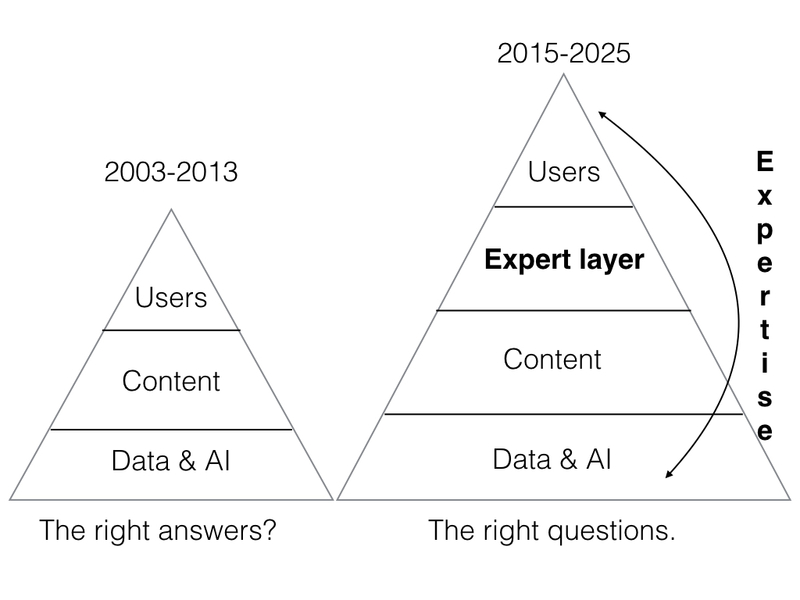 Thinking beyond the user, content and data layers...and the fourth layer: experts. Recently I have been meeting people in Boston & SF. I am talking to people there in Life Sciences, Startups, Publishing and Professional Services about the concept of The Expert Layer. But for most publishers like Thomson Reuters, Informa and Relix, their focus is on data. Yet data, is a commodity. Data has become the pivot - away from news and static content. One would argue that data has always been at the heart of these businesses but lately it seems that data is the only focus. Jim Smith, CEO of Thomson Reuters, talks about the "data layer" as the foundational component to create intelligence and provide their clients with the "right answers at the right time". The argument is that "data is the new oil," is not new. Indeed, we've heard this over and over. This IBM blogger has taken it a step further by saying data is the "new bacon". "It sizzles; it’s crispy; it’s essential to the complete buffet..."
Personally I like this better. But data, like Bacon is still a commodity. It is the insights that matter and insights come from both AI and from the expertise from the right people. Organizations will spend billions of dollars on creating complicated AI solutions to turn data (bacon) into intelligence (the buffet). But intelligence doesn't just come from AI. "Intelligence" needs to have another layer upon it, because what if AI returns the right answers but asked the wrong questions? This may seem obvious but ignoring it will invariably create a huge amount of wasted cost and resource. Intelligence or expertise is not just about the answers. IBM bought Truven Health Analytics because they had data and intelligence around that data. This $2.6b acquisition was in part a demonstration that Data (or Intelligence) equates to insights. Truven's access to healthcare data and the AI derived from this data and delivered to the user via content and reports, is indeed more powerful than just data. AI can certainly help in transforming data to be useful, predictive and responsive. But I argue that true insights can only be delivered by experts, and interpreted and debated by experts. Meanwhile, we are seeing the convergence of consulting and the knowledge industry unfold. Bloomberg's recent launch of their consulting practice shows that you need more than data and AI to drive true intelligence. So when Jim Smith says the "right answers at the right time", I think he is only partly right in that statement. AI and analytics take you only so far. And this is why the Expert Layer is so critical. Having the right people asking the right questions in a group forum is not new. But a resurgence of this is coming. And its not going to happen on Twitter or Facebook. Only the Expert Layer can deliver true insights and interpret them. Here is a quick and dirty architecture around this concept. This diagram was done by a human, dare I say an expert. So bring on the bots, and bring on the AI, but don't forget the people. They are the ones that will ask the right questions at the right time. At Zapnito we say, "if experts are at the heart of every organization, then expertise is at the core of our focus." And the fourth layer of value returns.